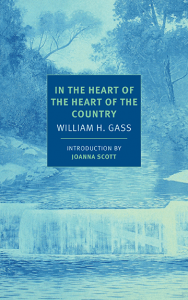 William H. Gass’ second published work contains much of his earliest writing, including the short story “The Pedersen Kid,” which Gass tells us took seven years to find a publisher. No doubt that has something to do with the complexity of these works, which play with form and narrative in such a way that the reader often feels destabilized, uncertain even of whose point of view is being described. In a Preface that is every bit as artistic as the stories that follow it, Gass refers to the “logarithmical disorders of my lyricisms,” and that is just what the reader senses: disorder, or at least the disorienting consequence of disorder. “The material that makes up a story must be placed under terrible compression,” Gass writes, “but it cannot simply release its meaning like a joke does. It must be epiphanous, but remain an enigma.” It is this “terrible compression” that makes Gass’ narratives so frustrating to follow, and at the same time so hugely rewarding. It’s more than a make-up; it’s more than a dream. It’s like something you see once and it hits you so hard you never forget it even if you want to; lies, dreams, pass – this has you; it’s like something that sticks to you like burrs, burrs you try to brush off while you’re doing something else, but they never brush off, they just roll a little, and the first thing you know you ain’t doing what you set out to, you’re just trying to get them burrs off. I know. I got things stuck to me like that. Everybody has. Coming, as it does, very early on in the story, the reader has little hope of fully understanding what the young boy is referring to in this passage. But as the narrative builds, as tensions escalate, and as the full extent of the father’s malevolence is revealed, the metaphor of the burrs becomes horrifyingly apt. What is being described is the young boy’s pain, or anger, or trauma – whatever it is that has been forced on him and will not easily detach. Even the text breaks down (the large spaces are Gass’ inclusion), giving us some hint that even this circuitous description was not easily won. Even the titular story, organized around subheadings relevant to the description of a midwestern town – Business, People, Religion, Weather and Education, for example – presents only broken vignettes of the town and its people, leaving to the reader the difficult job of piecing them together and finding coherent meaning. This is not an easy project, and Gass is not an easy writer to read. He has laboured over every sentence and demands a reciprocal effort from his readers, but to live in the atmospheres he creates, the tensions he builds, is to appreciate the full potential of the written word.